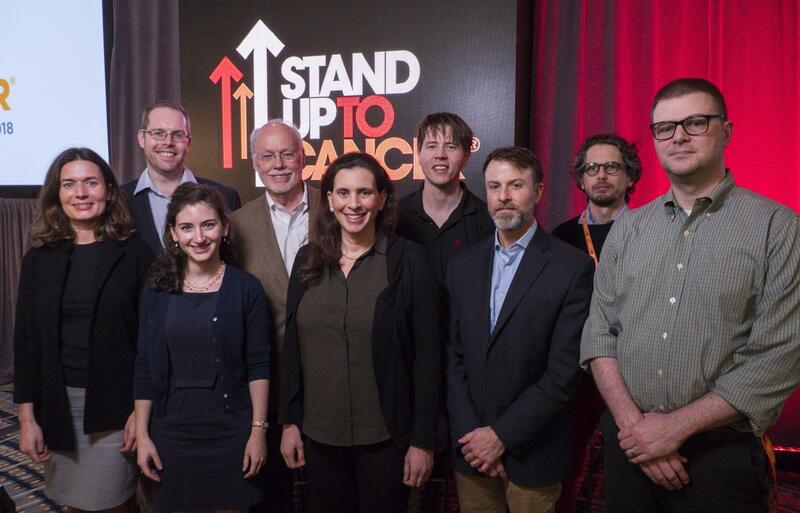 PHILADELPHIA – March 28, 2018 – To strengthen collaboration among scientists conducting cancer research, Stand Up To Cancer is awarding $1.25 million to five teams with members already within the SU2C research community to help them reach further across institutional and national lines to collaborate closely on new research projects, the American Association for Cancer Research, SU2C's Scientific Partner, announced today. The projects receiving funding were proposed during the SU2C Scientific Summit in late January in Santa Monica, California, and were selected "on the spot" by a board of experts, based on 250-word preliminary proposals. These tentative selections were subjected to a more thorough review and have now been fully approved by SU2C. "The Sharp Awards process, from selection through approval and funding, takes only a few weeks, which is the speed of light in the world of scientific research," said William G. Nelson, MD, PhD, director, Sidney Kimmel Comprehensive Cancer Center at Johns Hopkins in Baltimore, who serves as vice chair of the SU2C Scientific Advisory and oversees selection of the Sharp Awards. "The grants will bring our researchers even closer together and capitalize on synergies among their work." The SU2C Phillip A. Sharp Innovation in Collaboration Awards are named after Sharp, the institute professor at the Massachusetts Institute of Technology (MIT) and its Koch Institute for Integrated Cancer Research, and chair of the SU2C Scientific Advisory Committee, to honor the emphasis he has placed on collaboration among researchers. In selecting the winning projects, the committee placed particular emphasis on projects that involved SU2C researchers who have not worked together in the past, including collaborations between members of Dream Teams, Research Teams, and Convergence Teams, and between team members and recipients of SU2C's Innovative Research Grants, who are early-career investigators. "One of SU2C's great accomplishments has been to kick down the silos that we cancer researchers tend to work in," said Sharp, who received the Nobel Prize for Medicine or Physiology in 1993 for the discovery that genes can be discontinuous. "We emphasize collaboration among researchers at different institutions, with different skill sets. These awards take the level of collaboration to a higher plane." The awards include researchers who are members of four Dream Teams, two Research Teams, and five Convergence Teams; two IRG recipients; and one recipient of an SU2C Catalyst® grant. They work in three countries: the United States, Canada, and the Netherlands. Each team will receive $250,000. The total amount awarded includes a grant of $250,000 from the C4C Fund, a family foundation, specifically designated for metastatic colorectal cancer research. An additional grant of $250,000, provided by the Emily Whitehead Foundation, is contributing $125,000 to support one 2018 Sharp Award, and $125,000 to support one Sharp Award in 2019, both focused on pediatric cancer. "We are honored to collaborate with SU2C and fund these amazing researchers so they can further study pediatric cancer immunotherapy treatments," said Tom Whitehead, co-founder of the Emily Whitehead Foundation. "Our hope is to pay it forward and support the development of successful, less toxic treatments that will give more kids the chance to not only survive their cancer but also lead healthy and happy lives." Claire F. Friedman, MD, medical oncologist, Memorial Sloan Kettering Cancer Center, Mismatch Repair Immunotherapy Convergence Team member, and Marta ?uksza, PhD, formerly at the Institute for Advanced Study at Princeton, New Jersey, moving to the Icahn School of Medicine at Mount Sinai, Neoantigen TCR Degeneracy Convergence Team member, to conduct research on "Defining Effective T-Cell Response in Viral and Non-Viral Gynecologic Cancers." Raul Rabadan, PhD, professor, Columbia University, a principal investigator on the SU2C-National Science Foundation Drug Combination Convergence Team, and Dan A. Landau, MD, PhD, assistant professor at Weill Cornell Medicine and a core member of the New York Genome Center, a 2016 recipient of an SU2C Innovative Research Grant, for "Cupid-seq – high throughput transcriptomic spatial mapping of immune-tumor interactions in the micro-environment." E. John Wherry, PhD, director, Institute for Immunology, University of Pennsylvania, SU2C-Lustgarten Foundation Chimeric Antigen Receptor (CAR) T Cell Research Team co-leader, and Mismatch Repair Immunotherapy Convergence Team leader, and Matthew Hellmann, MD, assistant attending physician, Memorial Sloan Kettering Cancer Center, SU2C-American Cancer Society Lung Cancer Dream Team member, and co-leader of the SU2C Catalyst® Lung Cancer Epigenetics Team, for "Interrogating impact of epigenetic modifiers on durable reprogramming of exhausted CD8 T cells in patients with NSCLC treated with PD-1 blockade." Trevor Pugh, PhD, scientist, Princess Margaret Cancer Center, Toronto, a principal investigator on the SU2C Canada Cancer Stem Cell Dream Team, and David Barrett, MD, PhD, pediatric oncologist, Children's Hospital of Philadelphia, SU2C-St. Baldrick's Pediatric Cancer Dream Team young investigator, and 2017 recipient of an SU2C Innovative Research Grant, for "Characterizing immuno-variability in children following standard of care treatment to enable precision assignment to immunotherapy trials." Support for this Award includes $125,000 from the Emily Whitehead Foundation. Michal Sheffer, PhD, post-doctoral fellow at Dana-Farber Cancer Institute, Natural Killer Cell Resistance Convergence Team member, and Hugo J.G. Snippert, PhD, assistant professor, University Medical Center Utrecht, the Netherlands, young investigator on the SU2C-Dutch Cancer Society Tumor Organoids Dream Team, for "Studies of colorectal cancer patient-derived organoids to validate candidate biomarkers of resistance to natural killer cells." Funding for this grant was provided by the C4C Fund.